Today is the last day of a great giveaway! If you haven't yet commented on my post from April 11, 2014 , please do so now! I am giving away a FREE Marion Smith Bloom Impressions tool.....a $24.95 value! All you have to do is comment on the April 24, 2014 post here . That's it! Just place a comment and you are in the running! You can't win if you don't enter and today is the very last day to do so! I will post the winner tomorrow and the Bloom Impressions tool will ship to you in June. Even the company (Marion Smith Designs) is out of the Bloom Impression tool as this has taken CHA by storm and the orders were overwhelming. 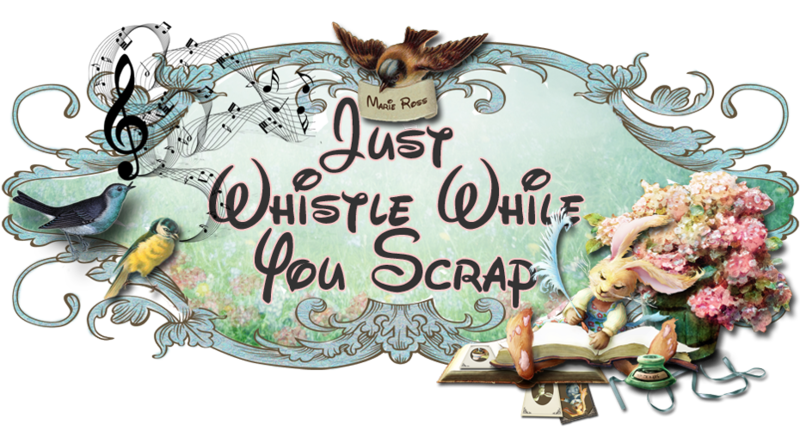 Don't wait another minute and comment on the April 24, 2014 post NOW! I have a new card for you today. 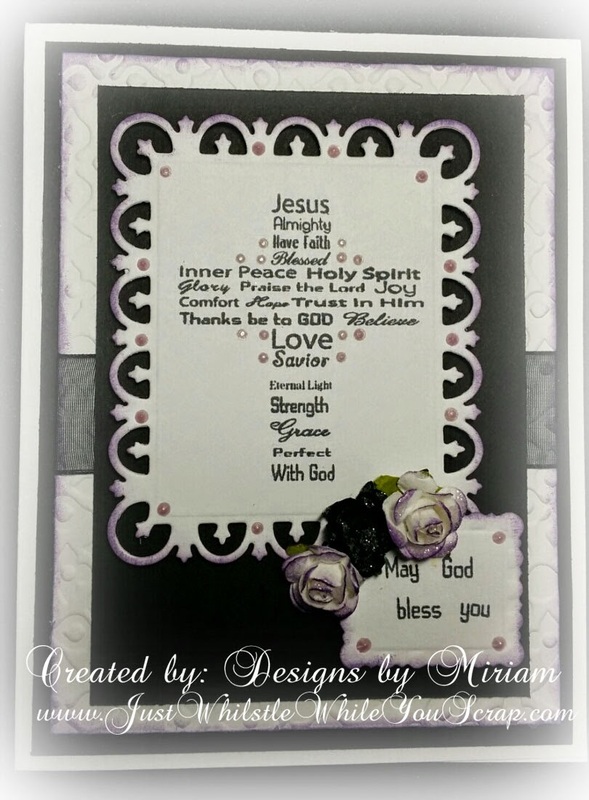 This card design was done with A Creative Journey with Melissa stamp set "Words of God" Set. This stamp set is very versatile as it can be used for Easter, Communion or as a sympathy card as I have used it here. I triple matted the card, embossed the white cardstock and sandwiched a ribbon in between . 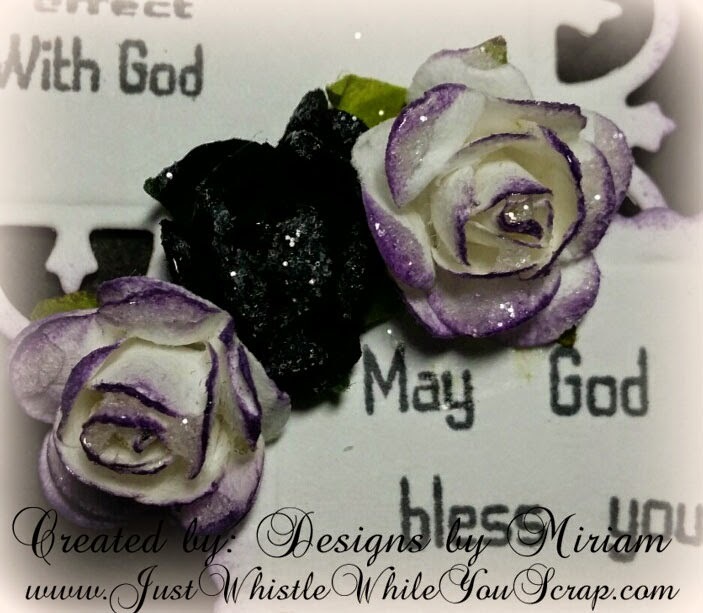 I used mounting tape to a Spellbinders die for a 3D effect, added one of the phrases and made some roses and glittered. I then added Viva Decor Pearl Pen for more dimension. You can stamp around the edges of the white cardstock and flowers with whatever color suits the mood. Very easy card to make and something that will be kept as a beautiful memory throughout the years. I hope you like this card as much as I enjoyed making it. Don't forget to comment to win! It all ends tonight at midnight PST! Enter HERE!